The tourism committee takes evidence on the Transient Visitor Levy, more commonly known as the tourist tax from council leaders. Scottish Labour leader Richard Leonard called on the first minister to apologise to young people let down by mental health services. Mr Leonard told the chamber 25,000 referrals to CAMHS had been rejected since the first minister took office. 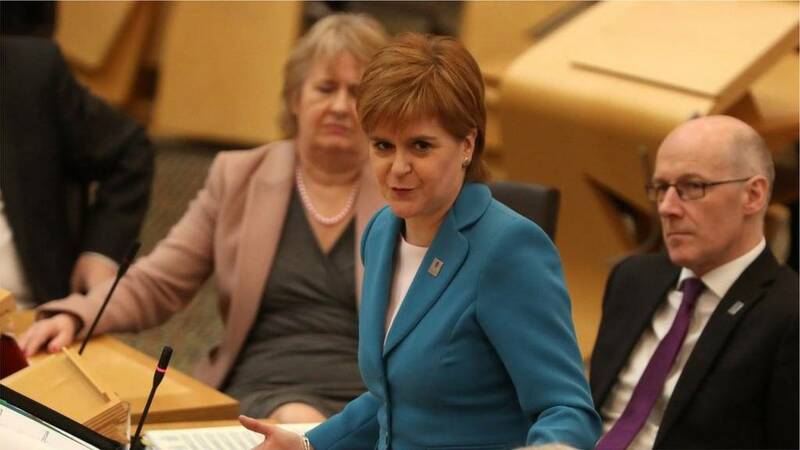 The first minister said she regrets that and apologises to any patient not seen by the health services as quickly as possible. However, she refuted Mr Leonard's characterisation of the issue and pointed to to investment and increases in the workforce. Earlier in the day the a joint report published by Audit Scotland and the Accounts Commission found that specialist services are struggling to cope with increasing demand. MSPs agree to the government motion as amended with 62 MSPs backing it and 58 abstentions. Just to clarify that all the amendments were agreed to. The Lib Dem amendment is agreed to with 117 MSPs backing it and with one abstention. MSPs agree the Conservative amendment with 62 MSPs backing it and 58 against. On ambitions to become a good food nation, the minister argues there are a number of actions which can be taken forward without the legislation. Ms Gougeon goes on to list the various Scottish food and drink products mentioned throughout the debate, including Stornoway black pudding which she says fueled her own recent half marathon! She also highlights local produce from her own area of Scotland, including goat tacos. It's hard not to be passionate about the sector but there are challenges, the minister states, pointing to Brexit in particular. Efforts to tackle food poverty will be integral to any work on the good food nation going forward, she tells the chamber. Rural Affairs Minister Mairi Gougeon begins her contribution by addressing calf exports to destinations outwith the EU to third countries, insisting that in the BBC investigation "we did not see any Scottish calves in that footage". We said to the BBC that if you have any footage or evidence of that taking place to give that to us, the minister states. Lib Dem MSP Mike Rumbles accepts the precise footage being talked about did not include Scottish calves, but insists public perception is incredibly important. On the BBC programme, it made it clear that they were not from Scotland. Ms Gougeon says she is trying to address public perceptions by clarifying what the footage was. Labour MSP Colin Smyth argues that as long as livestock is exported, the Scottish government cannot guarantee animals will not end up in countries where animal welfare standards are not as high. The minister tells him this is why research is being undertaken to ensure this is not happening. Tory MSP asks what message does ditching good food nation bill send? Tory MSP Rachael Hamilton says she will explain why the Scottish Conservatives have misgivings about the government's ambition for the food and drink sector. Ms Hamilton states she is not surprised people are a little bit dissapointed that the government decided to "effectively ditch the good food nation bill". What sort of message does ditching this send out, she asks. Mr Ewing reiterates his pledge that the government bring forward legislation that will underpin Scotland as a good food nation." The minister insists the government did not say, in a previous programme for government, that it would introduce legislation, only that it would consult the public on the legislation. Ms Hamilton says: "I just want to clarify from the official report that the cabinet secretary told the parliament that the decison on the bill timetable will be taken in the context of the government's overall legislative programme." "I don't really know how that squares with the intervention," she says. Labour MSP Alex Rowley highlights the right to food exists in international law, but he argues it needs to be enshrined in domestic law too. We need a system that treats people, livestock and the planet fairly he states. A whole-system approach to supporting farmers and food producers is required the Labour MSP insists. He says having a legal right to food would help create a framework for this type of approach. Scottish fruit and vegetable producers have drawn up a new strategy to boost the industry in response to Brexit. Business leaders fear it could be hit by a slowdown in European exports and a shortage of workers once the UK leaves the European Union. The Fruit, Vegetable and Potato Industry Leadership Group wants to support the industry through to 2030. It said the strategy would benefit the nation's health and environment - as well as the economy. The Scottish fruit and vegetable retail market, excluding foodservice, is worth over £1bn. Green MSP Mark Ruskell says there is a need to bring disadvantaged young people in to the success story that the food and drink sector is. Mr Ruskell explains there has been very good work done which needs to be carried through in legislation. The Green MSP insists it is important that there is a "right to food" in the good food nation bill. He says the legislation must address the issue of social equality. Lib Dem MSP Mike Rumbles says the Scottish government must be focused on boosting quality and animal welfare. He and his party colleagues will support all the amendments put forward today. Mr Rumbles argues having high quality produce raised to the highest welfare standards must not only be true, but also seen to be true. Addressing any problems must be dealt with as soon as they arise, he insists. The food and drink sector in south west Scotland has been described as an "engine" of the local economy. It is reckoned to employ nearly 14,000 people in Dumfries and Galloway with an annual turnover of £1.29bn. In line with the national strategy Ambition 2030 it is now hoped to double that value over the next 12 years. But what does the area think it has to offer that might allow it to see such a huge expansion and help boost tourism and the wider economy? Building 'brand Scotland' is key to promoting Scotland's food and drink, SNP MSP Emma Harper states. She goes on to highlight food and drink produced in Dumfries and Galloway, saying all these businesses should be supported and celebrated. The industry turnover has increased by 44% since 2007, while exports have grown by 56% the SNP MSP notes. She expresses concern about the possible impact Brexit will have in terms of labour, calling for immigration to be devolved to Scotland. Labour MSP Claudia Beamish states a good food nation bill will promote producers and ensure the sector is sustainable. She argues sea lice issues have gone on for too long and she urges action to be taken to ensure Scotland's salmon industry's reputation is not further harmed. Rural Affairs Secretary Fergus Ewing highlights progress on the matter, including a fish health framework. Ms Beamish replies: "Where we are is not good enough and it needs to be sorted." There is much good practice elsewhere though, she adds, saying we should look to share this wider. A new strategy for venison has been launched by the Scottish government. It brings the farmed and wild venison sectors together for the first time, setting out nine keys areas for growth. This includes a skills-building initiative, a new entrants fund and a focus on research and development. Tory MSP Edward Mountain explains he is a partner in a farming interest and goes on to say Scotland is a world class producer of food and drink. Mr Mountain says it has been a very tough year for farmers, highlighting the difficulties in getting quality barley for distillers. He turns to this winter, pointing out: "There is a genuine fear much needed feed will be in short supply." Mr Mountain welcomes the loan scheme from the government but calls for the payments to brought forward to November.